Sound It Out is screening again on Tuesday March 15 at 8:45pm at the Alamo Ritz 2, and Thursday March 17 at 3pm at the Alamo Ritz 1. Sound It Out (Director: Jeanie Finlay): Nostalgia is bound to be a part of any examination of record shop culture, and there have been a number of recent documentaries on the subject (I Need That Record!, Red Beans & Rice). But nostalgia works best when it’s specific and personal, and the fact that director Finlay grew up three miles from the record shop she profiles in Sound It Out gives it a lovely handmade and intimate feeling. 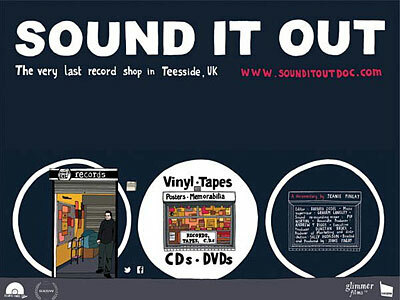 Sound It Out is actually the name of the last remaining record shop in Stockton-on-Tees, a struggling post-industrial town in England’s Northeast. Amiable owner Tom has been selling records for two decades, often to the same customers. We meet many of them in the course of the film, and there are more than a few memorable characters. All have an opinion as to why almost all record collectors are male, although no one really seems to worry about it too much. But the truth is that for people with obsessive and geeky pursuits, the shop is like liquor store and AA meeting rolled into one. This almost seems like a perfect description, given that it is located between a job centre and a fishing tackle shop. It’s clear that Stockton is a rough town, with very few decent jobs and almost no interesting activities for young people. The shop has become a meeting place not just for nostalgic thirty- (not to mention forty- or fifty- or sixty- ) somethings. It’s also a hangout for young men with widely different musical tastes, from the hard dance types seeking “makina” (a type of Spanish techno popular in the Northeast) to metalheads looking for obscure subgenres. Everyone enjoys the personal touch that Tom and his sidekick David provide, along with their encyclopedic knowledge. It’s clear that they care about music, not just about selling music. Especially in an economically depressed place like Stockton, this authenticity means a lot. It might be due to the presence of a female director in a generally male-dominated hobby, but all the lads seem like genuinely lovely people. Especially the younger set. From the two most sensitive headbangers you’ll ever meet, to the goofy but kind-hearted DJs playing music in the shed behind their house, to the more ambitious DJ duo of Frankey and John-Boy, their shared love of music and their ability to verbalize how it helps them express their feelings is heartwarming. The thirtysomethings are perhaps the most cerebral. Veteran Status Quo fan Shane knows exactly why he collects so obsessively, prefacing many of his comments with “I know this will sound…” But when he confesses that after his death, his will specifies that all his vinyl be melted down and made into a coffin, he knows he’s going beyond the boundaries of the rational. Longtime customer Chris, the only one with a well-paying job, deposits money monthly into a credit account at Sound It Out. He knows he’s running out of room to store records, but seems sad at the prospect of giving up his regular purchases at the shop. One of my favourite characters shows up a few times during the film. Since the shop is located near several pubs, he probably represents a certain type of customer who might be entertaining in a film, but maybe not so much in reality. He comes in early in the film, clearly in the clutches of a few pints, asking for Dire Straits “Sultans of Swing,” which he has just heard on the jukebox. He makes several more appearances throughout the film, and almost every time leaves the staff trying hard to suppress their giggles. It’s this sense of “warts and all” community that makes the film so charming. Sound It Out doesn’t try to tell the story of the music industry. It just tells the story of Tom’s little record shop on Yarm Street in Stockton-on-Tees. If I had only one criticism of the film, it’s that I’d like to have learned more about Tom himself. He comes out with some of his own record shop philosophy, such as “records hold memories” and “the shop is an escape,” but in the end, I felt I knew more about the nameless man in the pub than about Tom. In that respect, this is not quite the real-life version of Nick Hornby’s High Fidelity that I’d expected, but it remains a lovely and generally positive portrait of life in a provincial English town. This entry was posted in Documentaries, Film Festivals, SXSW and tagged #sxsw11, music, uk. Bookmark the permalink.